Many people around the Townsville area will right now be preparing boats and fishing gear in anticipation of the opening of Barramundi season. Beware, the season does not begin until MIDDAY today. So don't get tempted to wet a line too early! 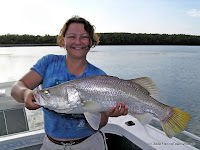 If you are fishing in the Gulf or Carpentaria you have one more day to wait. Season opens there midday Feb 2 (tomorrow). Barramundi also currently cary a minimum size of 58cm (Gulf of Carpentaria 60cm) and a maximum of 120cm. All fish outside those measurements must be released. The maximum number of fish alowed in one persons possession at any time is 5. For more information of regulations in Queensland visit the DPI&F fisheries website. With the current weather position I'm sure where people will be wetting a line? But if you do get out and about please let us know how you go. You can do that either here in the comments below, of in the reports section of the forum. This is out 3rd good wet season in a row now, so I'm looking forward to a great fishing season.